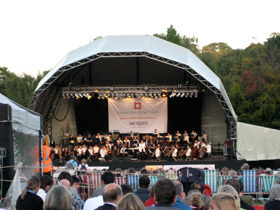 Blessed with a beautiful summer's evening, the last night of the Kenwood Proms certainly proved how brilliant the British are at picnicking. Forget Union Jack flag-waving for the theme from the Dambusters or Jerusalem - wave the flags for the genius of the bag that turns into a seat, the drink cooling slots in the picnic hamper, brightly painted woven baskets, many bottles of wine and homemade goodies aplenty. Then joy at the picnic smug folks getting rat-arsed and spilling Rioja on their tartan blanket before forgetting where they were sitting when off to the (very classy) temporary loos. That's what's Kenwood's about. The Royal Philharmonic Orchestra are in fine form with the wonderfully named Alfie Boe (Alfie!!) guest opera star in tow and it's full steam ahead with everything from the Cornetto Song to the Blue Peter theme tune - a totally accessible bill with nowt taxing - fortunately, the conductor is an affable man who turns round from time to time and tells us the real names and who by. It might be largely a well dressed, well equipped Hampstead kinda set but there's also the rabble here; the spangly hat wearing, flag-waving, arse-shaking, flourescent bunny ear equipped crew that are on their feet for Elgar's Pomp and Circumstance and bawling out Land of Hope and Glory like it actually means something these days. The Can-Can encore is accompanied by a stunning firework display with many ooh and aahs and then plenty of conscientious picnic clearing away-ness. Music at Kenwood on a summer night - whatever your thoughts on prom flag-waving and whatever your classical music expertise - is beautiful and if you can't afford the ticket next year, take advantage of the free cordoned off picnic area by Kenwood House. You can't see the band but hey, who needs that when you can "da da da da da da da da da daaa" along to Tchaikovsky's 1812 Overture?